Last week we shared the ‘the ten most tipped stocks for 2019’ each of which received more than 1% of the ~2500 stock tips from readers in our recent survey. Today's wire looks at the next tier down: the stocks that got between 0.5% and 1.0% of tips. It’s an interesting list with a few surprises, so let’s see what the professional managers think about each of them. “Looking at the two vertically integrated financial advisers AMP and IOOF, it is tough to see the near-term catalysts that will transform them into stars in 2019. The final report from the Royal Commission into Misconduct in the Banking, Superannuation and Financial Services Industry is due to be delivered in March 2019 and is not likely to be kind to these two companies. Similarly, the three building materials companies in the above table are unlikely to see a reversal of the trend of declining building approvals over the next twelve months. We are deeply disappointed with AMP’s divestment of its Australian and New Zealand wealth protection and mature businesses (a question of value). We are equally disappointed with the manner in which it has been handled by the company and the board of directors (a question of governance). We simply cannot understand how proposing to divest such a large component of a company’s enterprise value without shareholder approval or an independent expert’s opinion can be considered appropriate or acceptable by any investor in Australian shares under any circumstances. In the last episode of Buy Hold Sell for 2018, Matthew Kidman asked Tobias Yao from Wilson Asset Management and Arden Jennings from Ausbil for their views on Baby Bunting, with both managers positive. You can hear their synopses here. Essentially, is the “Bunnings” of baby retailing. Since being first listed on the ASX in November 2015 it is now the leading baby retailer in the country. It has over 50 stores and is looking to grow its store network to over 80 stores. I am positive about Baby Bunting for two reasons. Competition: Over the last twelve months, Baby Bunting’s competitors have been decimated in a tough retail environment, leaving it to be the dominant player in the market. With 50 stores, compared to its nearest competitor who has only 3 stores, Baby Bunting is in a strong position. With the departure of Babies R Us, Baby Bunting is looking to accelerate its growth by taking on the vacant leases. Margins: At present, Baby Bunting is only doing 6% EBITDA margins, and we believe margins can get to 10% over the near term. "Similarly, Mineral Resources (MIN) produced one of the more interesting deals, agreeing to sell a half-share in its Wodgina lithium project to battery metals giant Albemarle (NYSE: ALB) for $A1.58bn. The deal certainly raised eyebrows given the Wodgina asset itself was only purchased by Mineral Resources in mid-2016 as a then- mothballed tantalum mine from Global Advanced Metals for less than $100m. Quite incredibly, the implied valuation of the Wodgina asset by the Albemarle deal (~$A3.16bn) equated to the entire market capitalisation of Mineral Resources at the time of the announcement (essentially ignoring the additional iron ore and mining services businesses that currently generate some ~$500m in EBITDA per annum)". We’ll be keeping a close watch on Nearmap’s cash and cost base management as FY19 approaches. We expect the US expansion may require an increase in sales and marketing expenditure to adequately penetrate that significant market. That said, Nearmap’s market is massive and with a proven organic growth track record, research and investment into new market-leading products, strong balance sheet and attractive LTV/CAC it seems well positioned to climb through turbulent times. A more dovish outlook from the US Federal Reserve in December, with the outlook for interest rate hikes for 2019 and 2020 lowered vs expectations earlier in 2018, following commentary that policy settings were approaching a neutral level and the implication that the end of the monetary policy tightening cycle is closer. Given that backdrop, it was notable that there are three gold stocks on the next most tipped list. These include Evolution (EVN) and Northern Star (NST), both are close to becoming ten-baggers in under five years, and Aurelia Minerals (AMI), which cratered at 1.3c in 2015, and now trades at 79.0c today with a $700mil market cap. "Evolution Mining (EVN) is an ASX-listed gold miner with a market cap of A$5.2bn. Evolution provides the portfolio with exposure to the gold price as well as to an asset base that has low capital intensity growth options. We believe this growth can be funded without stretching the balance sheet, even if the gold price falls. We believe the market is yet to price in the growth potential at Cowal, Evolution’s largest mine. Guidance is for flat gold production over the next three years, but during a recent site visit to Cowal the Manager concluded that there is high potential for production to increase." “…it'll be a replay of what Northern Star did with Jundee, with what Evolution did with Cowal. They're going to put more feed through the mill, they'll buy other mining operations along the strata length there in the Cobar Basin. They'll drive the cost down and create enormous value to their investors". "Over the next year we estimate free cash flow will be about $150 million, that's 25% of their market cap back within a year. So that's a great metric when you look at that and you look at two times into enterprise value to EBITDA, there's no doubt it's a cheap name, plenty of growth still to come with a great management team as well. That's one we like as well". 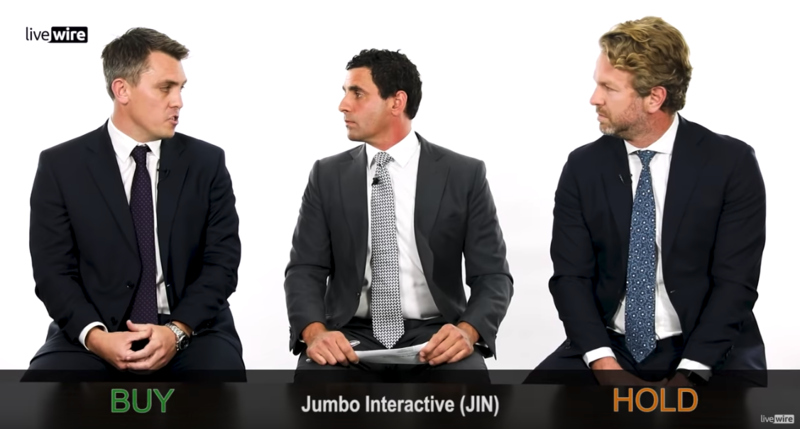 Lottery game reseller, Jumbo Interactive (JIN), doubled in price during the second half of 2018, to put it up 8-fold over 4 years, and it is already on the move in 2019. James Dougherty from Lennox Capital and Oscar Oberg from Wilson Asset Management discussed the stock on Buy Hold Sell recently. James was more guarded, with a ‘hold’, saying: “They've done a really good job with customer acquisition and slowing down churn, but the share price move in August meant that it's now a hold for us”. “The changes to Powerball have been very positive for the business, from the perspective of the first eleven jackpots of FY19 have had a value 60% higher than the average over FY18. It's a very strong balance sheet. There's prospect of special dividends and acquisitions. It's a buy”. "A financial group comprising a Life Company, which specialises in retirement income products and annuities and accounts for most of the group’s earnings, and a funds management business. As baby boomers continue to move into retirement, it is inevitable that annuities will become a major and rapidly growing product". Nanosonics (NAN), is a small cap healthcare company involved in the production of ultrasound probe disinfectors (and respective consumables). While it was more popular a few years ago, it is not a stock that we have much recent manager commentary on recently. “Caring for patients better that are already in the system remains an area of future growth, one that Australasia appears to excel at. Companies like Fisher and Paykel Health (FPH) or Nanosonics (NAN) improve critical hospital outcomes and have developed global markets”. More of the most tipped stocks? The surprises continue further down the spreadsheet. So, if you are interested in being the first to see a third (and final) wire covering them, please hit the follow button below. Alternatively, please like, comment or share this with investing friends. Thanks for your support, and all the best for a prosperous 2019! Excellent commentary Alex both with most tipped stocks and next most tipped stocks - is it time to revisit the Mining/Resources sector which appears to be coming back?? Yes Daniel, painful day for those of us who had been listening to all the general positive commentary of recent days re CGF. Anything but hot.